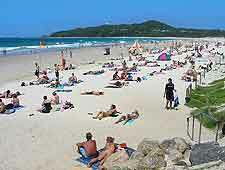 The beaches of Byron Bay are simply spectacular, as are the eateries and the nightlife opportunities. Tourists flock to Byron Bay each year, to kayak with the dolphins, to watch the migrating humpback whales, and to enjoy the wealth of available alternative therapies and treatments. There is no denying that Byron Bay has become an exciting and vibrant tourism destination, with coastal footpaths galore and plenty of appeal for backpackers. The local tourist information centre / visitors centre is to be found on Jonson Street, where it occupies the Stationmaster's Cottage. 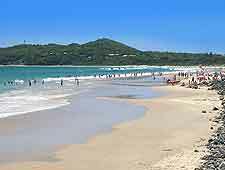 Located right in front of the town is the aptly named Main Beach, while on the western side of Byron Bay is Belongil Beach, where nudism is welcomed. Understandably, outdoor attractions form the bulk of the tourist attractions that Byron Bay has to offer, with many making the very most of the coastline and its wonderful views. Visitors can expect to find cycle trails, cliff-top pathways and treks leading to the summit of Mount Warning. Cruises to Julians Rocks are extremely popular and this spot is renowned for its exceptional coral reefs and subsequent scuba diving possibilities. Various national parks lie just outside of town, such as the Arakwal National Park, the Brunswick Heads Nature Reserve and the Cape Byron State Conservation Area. Others may prefer to take a flying tour onboard a powered glider, seeing the coastline from an altogether different perspective. 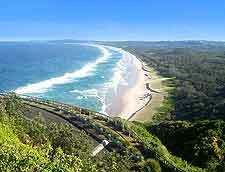 More information about Byron Bay Tourist Attractions. The shoreline of Byron Bay affords endless photo opportunities, and there is one landmark here that regularly appears on tourist snaps - the Cape Byron Lighthouse. 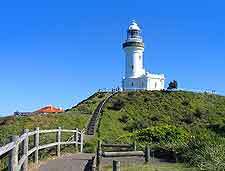 This bright white lighthouse marks the most easterly point of mainland Australia and is conveniently located alongside several walking trails and lookout points, being named after great British poet George Gordon Lord Byron by legendary explorer, Captain James Cook. Other significant points of interest in the area are generally shaped by the hand of nature and include the waterfalls in Nightcap National Park and nearby Ballina, and the Two Sisters Rocks, which dominate the southern side of the bay, close to the Broken Heads coast. 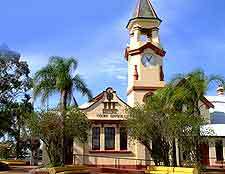 More information about Byron Bay Landmarks and Monuments. Although they is much culture apparent in the Byron Bay area, there are only a handful of museums and galleries - most tourists are more interested in the beaches and surfing. Just a short drive away, the Nimbin Museum resides in the small village of Nimbin and celebrates the laid-back local hippy scene and hedonistic lifestyle, while in Ballina, leading attractions include the Ballina Naval and Maritime Museum on Regatta Avenue, and the David Mackay Harrison Galleries on Bayview Drive. In Byron Bay itself, the Bim Bam Gallery on Lawson Street is packed with indigenous Aboriginal art and crafts, being a reliable place to purchase a quality souvenir or two. More information about Byron Bay Museums. The 'Rainbow Region' of New South Wales is extremely enticing, and many tourists choose to take excursions and head out of Byron Bay for the day. Leading nearby attractions include the small town of Bangalow, the market town of Channon and the city of Lismore, the latter of which is well-placed for those wishing to explore the Far North Coast Hinterland. 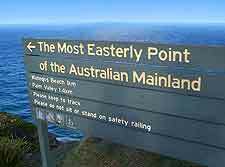 The scenic Pacific Highway leads to many northern destinations, such as Tweed Heads, Mermaid Waters and Surfers Paradise. Further north, Brisbane (Queensland) is quite reachable by car in under three hours and is currently the third-largest city in Australia, being home to a cosmopolitan atmosphere, riverside parks and a huge array of theatres. 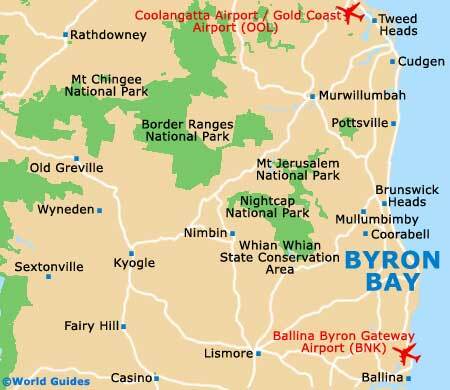 More information about Byron Bay Attractions Nearby.